Horses, unlike ATVs, can't be put away for the winter just because they're not being used. Horse health and care is a year-round process. Good nutrition, vaccination schedules, parasite control and other care should be continued throughout the winter. Dale Miller, Marion County program director and equine educator with Iowa State University Extension and Outreach, offers some reminders about winter horse needs for good ventilation, feed and water management, and exercise. Miller adapted the recommendations from a publication by Dr. R. D. Scoggins, a retired equine extension veterinarian with the University of Illinois. Fresh air and/or good ventilation are major requirements for horses kept inside. Judging from their own perception of what's comfortable, humans tend to close barns up too tightly. Horses can tolerate considerable cold if they can move around and are dry. Avoid drafts, but allow sufficient air exchange to move stale air, humidity and ammonia out of the environment. Keeping stalls clean is necessary to keep ammonia levels low. Studies at the University of Illinois have shown that ammonia concentrates at about 18 inches above the surface of the bedding (where the horse's head is located when it lies down). High levels can cause a decrease in athletic ability and overall quality of life. This emphasizes the need to keep stalls cleaned regularly. Horses need free-choice, good quality hay, loose salt and minerals, and water heated to 45-65 degrees Fahrenheit. Several studies have shown that warming water to 60 F will increase water consumption by 40 to 100 percent. Dehydration (lack of water) is the number one cause of impaction colic in horses. 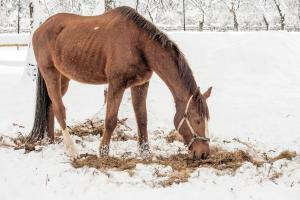 Cold weather combined with a diet of dry feed also can cause impaction colic. Warming the water is much more effective than feeding bran, linseed meal or other so-called laxative diets. Most horses will not require grain if the hay is of good quality. Hay generates more heat than grain does during digestion and thus is more helpful in maintaining body heat during cold weather. However, the extra energy provided by grain may be needed to maintain normal weight when the horse is exposed to severe low temperatures or deep snow. Attempting to maintain some level of physical fitness will decrease the time needed to get the horse in shape for the coming season. Exercising three times a week for an hour at a walk and trot will help maintain physical fitness. Use this time to increase flexibility by doing suppling exercises at the walk and trot to reduce the incidence of lameness. When working horses in cold weather, warm horses up slowly and thoroughly before asking for serious work. In cold weather most horses are more "cinchy" when being saddled, so be sure to move them before mounting. Hot horses need to be cooled thoroughly then brushed to stand the hair up again before turning them back out. Fluffy hair traps air and keeps the horse warm; hair plastered down flat or wet lets body heat escape. During all seasons, horses are generally better suited to being outside where they have an area for adequate exercise and access to a windbreak or run-in shed for shelter. Horses not in competition should have shoes pulled and hooves trimmed regularly, every six weeks. Let their hair coat grow out for natural protection during the winter. By anticipating weather changes and adapting exercise schedules and feeding programs accordingly, there is no reason not to enjoy horses all year long.